Make a truly passionate and bold statement with this bouquet of 12 Red Roses. Each bouquet is complemented with splashes of gypsophila, fragrant eucalyptus and a palm leaf frame. Our florists have also included a box of luxury Valley Chocolates to make this romantic gift that much sweeter! 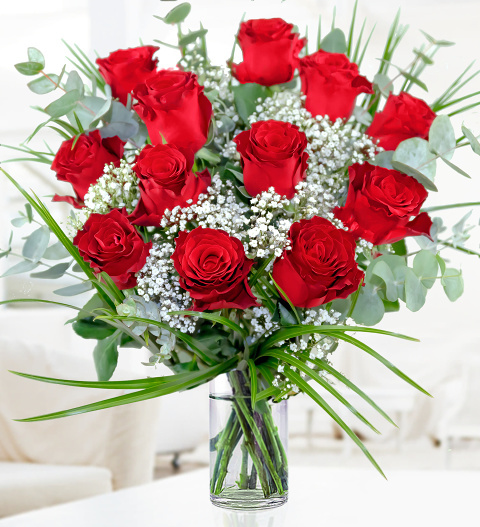 12 Red Roses are the perfect romantic bouquet to send to your loved one - order by 10pm for next day delivery. This long lasting Rhodos rose comes with an average head size of 5cm measured from base of the head to the top.